The Shakespeare400 happenings were in full swing yesterday, in commemoration of the 400th anniversary of the Bard’s death: April 23 is always a big Shakespeare day because it is the accepted date of his birth and the actual date of his death, and in this particular year yesterday was even BIGGER in Shakespeare world, on both sides of the Atlantic, perhaps even around the Anglophone world. I was thinking about Shakespeare and how I wanted to mark this moment with a post, and there were just too many possibilities: too many historical and cultural sources, too many interesting words and characters, too many deifying moments in centuries past. So I decided to get more personal and focus on my own introduction to Shakespeare, in the form of a classic text titled Tales from Shakespeare first published in 1807 and never out of print thereafter. 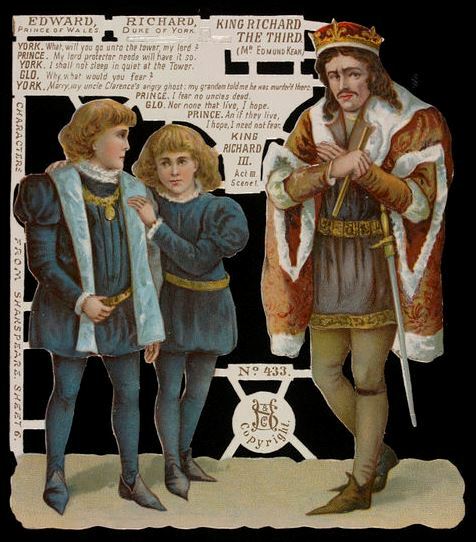 The Tales was the work of a pair of London siblings, Charles and Mary Lamb, who managed to produce abridged and modernized tales of Shakespeare’s plays despite family tragedy and between bouts of the latter’s insanity (Mary had actually injured her father and murdered her mother a decade earlier while Charles was out of the house; she was released to his care but he kept a straitjacket within easy reach). Charles abridged the tragedies into plain modern prose, and Mary the comedies (!!! ); they collaborated on the preface. The first edition, with illustrations taken from copper-plate engravings by William Blake, appeared in 1807 under only his name. William (and Mary) Lamb, Tales from Shakespeare for the Use of Young Persons, with illustrations based on the copper-plate engravings of William Blake (1807), Folger Shakespeare Library; My edition of Lamb’s Tales from Shakespeare, with illustrations by Karel Svolinsky. Middlesex: Paul Hamlyn (1968). I use Shakespeare quite a bit in class to illustrate certain aspects of Elizabethan and Jacobean life, and while I will quote his words directly to my students I must admit that I still consult my childhood version of the Tales to figure out exactly what I want to quote from. Or to remind myself: this book gave me a frame of reference to which I can tap into pretty easily, and which I have “filled in” over the years by reading the source plays. I’m sure this is what the Lambs intended, and I’m grateful to them. I also enjoyed learning about the publishing history of their book over a few hours yesterday: obviously I could have spent many more. Following Blake’s example, a succession of illustrated editions issued over the period from about 1860 to 1940 seem to have ensured the continued popularity of the Tales, which eventually became Lamb’s Tales (like my 1960s edition, above). The most accomplished illustrators of their eras embellished glorious editions: Sir John Gilbert in 1866, Arthur Rackham in 1899 and 1909, Louis Monziès in 1908, Walter Paget and Norman Price in 1910, Louis Rhead in 1918, Elizabeth Shippen Green Elliott in 1922, D. C. Eyles in 1934. And then of course there were also mountains of not-so-glorious (in imagery) editions produced “for use in school”: how can we possibly measure the impact of this essential epitome of Shakespeare? A very poorly proofread Gilbert edition from 1882 and the Boydell Gallery edition from 1900; Title page and illustration from a 1909 Rackham edition; Illustration and front and back matter from 1910 Paget edition; Louis Rhead illustration, 1918; Elizabeth Shippen Green Elliott frontispiece, 1922; variant Puffin Classics editions (with an introduction by Judi Dench). April 23 is a big day for Anglophiles, marking the birth (and death) of William Shakespeare and the Feast of St. George, the patron saint of England. I have never really understood how St. George became the patron saint of England, so I’m going with Shakespeare. And as I’m not a literary scholar, I’m going for scraps, bit of ephemera that were quite the rage in the nineteenth century, when scrap-booking became a popular leisure activity, and scrap screens began appearing in parlors on both sides of the Atlantic. 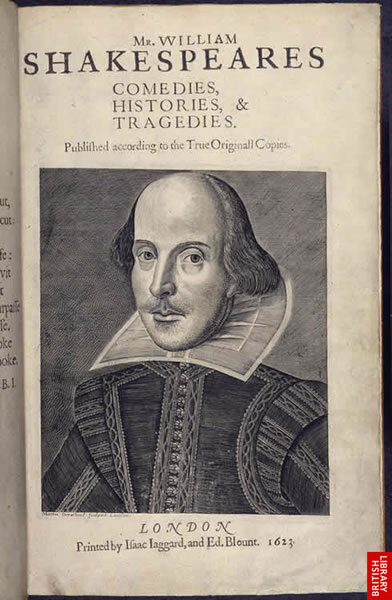 Title Page of Shakespeare’s First Folio, 1623, British Library; Jane Carlyle’s Scrap Screen, 1849, at the Carlyle House in London, Treasure Hunt. There’s nothing particularly novel about pasting images in a book or on a wall, but printing and paper technologies in the nineteenth century commercialized the activity, like everything else. Scraps for sale first appeared as black and white engravings at the beginning of the century, and by the latter half they were colored by chromolithography, embossed, die-cut and sold as sheets at the local stationer. Mrs. Carlyle’s screen above is made of more “found” examples, but many people seem to have preferred the more glossy materials that could be found at the shop. 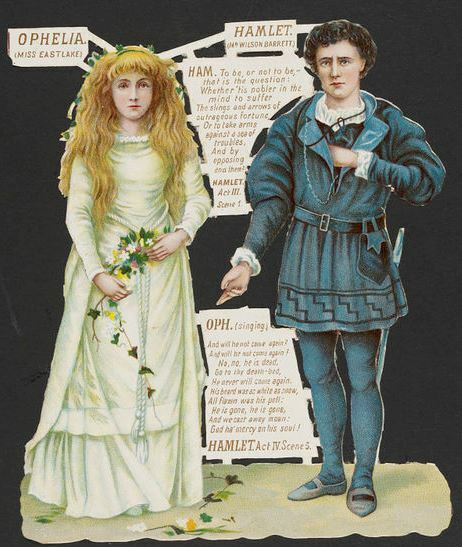 In the collection of the Victoria & Albert Museum in London, there are some wonderful scraps of Shakespearean characters, vividly bringing them to life for those that could not see them on the stage. Sigmund Hildesheimer & Company’s Characters from Shakespeare. A Series of Twelve Relief Scraps depicted characters played by popular actors, and were sold in packs costing one shilling in the 1890s. 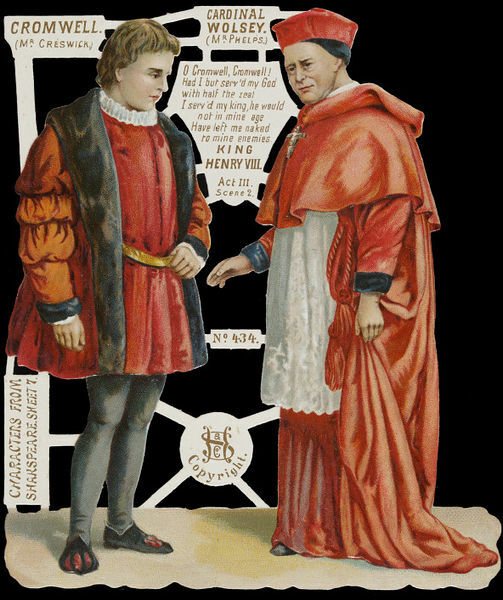 My favorites are below: Romeo and Juliet, Richard III and the two “princes in the tower”, Ophelia and Hamlet, and Cromwell and Wolsey from Henry VIII. 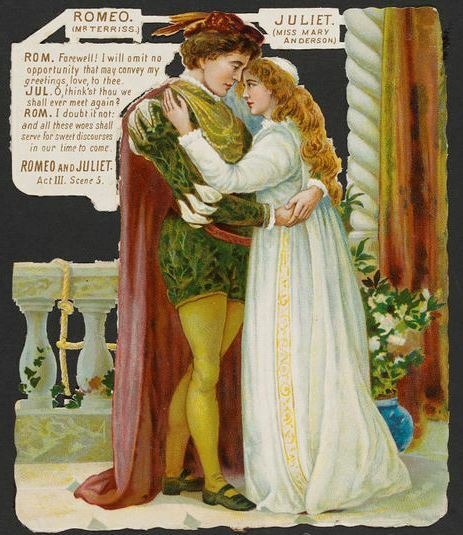 Shakespearean Scraps by Siegmund Hildesheimer & Co., c. 1890, Victoria & Albert Museum, London.